Sauté shallot with 1/2 Tbsp olive oil, add kale and 1/2 Tbsp olive oil and sauté until wilted. Finish with soy sauce and black pepper. Set aside. Sauté carrot less than 1 min. Do not over sauté. Sauté sprout with canola oil and salt just until wilted. Finish with sesame oil. Sauté zucchini with salt and olive oil until slightly tender. Place all sauce ingredients into a blender and mix until blended well. When you marinate meat, make sure to separate each slice and dip into sauce evenly. Marinate about 2 hours. Heat iron pan smoking hot, spread out cooked rice (8 oz per serving), make a hole and crack egg in center. Add prepared carrot, zucchini, bean sprout and kale. 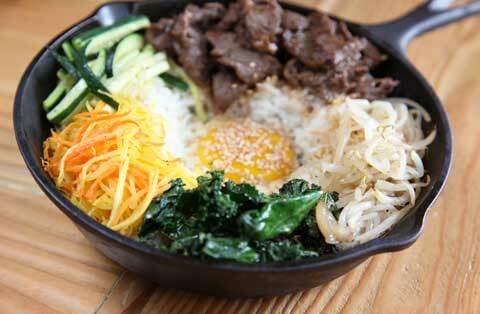 Cover the iron pan and reduce to medium heat while cooking bulgogi meat in a separate pan. When bulgogi is cooked, add bulgogi in iron pan. Add pinch of salt and sesame seed on top of egg.